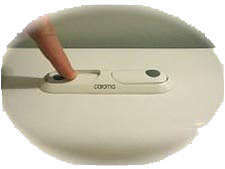 Dual flush toilets have one button or lever that uses a standard 1.6 gallons per flush, for shall we say solid wastes. Some of these water saving toilets use even moderately less than 1.6 gallons of water for solid waste flushes. While the other button or lever uses anywhere between 1.4 gallons per flush or as low as .8 gallons for liquid wastes. Since liquid waste require less water and therefore less pressure to properly flush, these low flow toilets make saving water and money very practical and very convenient. The two flush option to reduce the amount of water used to flush liquid wastes alone can save you and your family from 20% to 40% of water, when compared the industry standard 1.6 gallons per flush toilet. Dual flush toilets that use 1.28 gallons (or less) for liquid flushes are certified high efficiency water saving toilets as well. So water saving minded consumers should look for models that have earned the EPA or U.S Department of Energy water sense logo. Old toilets can be very prone to costly and sometimes unnoticeable drains and leaks. A quick and easy toilet tank leak test can detect even the smallest leaks. Often either a toilet flapper leak or a leaky toilet fill valve is responsible for a leaky or running toilet. Both toilet tank parts are very inexpensive and can be easily installed by just about anyone.